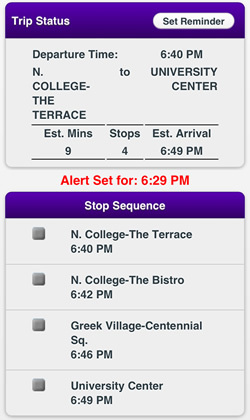 Set up trips, view departure times, see trip details, and set alerts to be reminded about trolley arrivals for the HPU Trolley system at High Point University in High Point, NC. HPU Trolley provides a simplified tool to access the trolley data and be reminded of trolley arrivals. Stop Sequence, Estimated Duration, Number of Stops, etc. 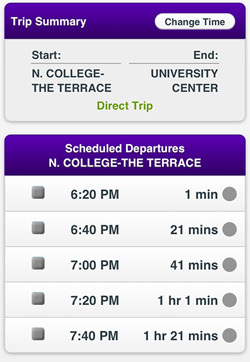 Allows students to check for available trolley times and set alerts to remind them to get ready to board. To specify a time later in the day or evening as opposed to the current time. Request to set an alert to remind you to get ready to catch the selected trolley at the start station. Helps to remind you to leave the dorm, pack up from the library, or make your way out of the party to catch the target trolley.